Take a twist on the norm in water coloring! Add intense color and sparkle with Dazzling Details and Ink Refills. See this fun Video Tutorial on the fun in this twist on a water coloring technique on this Technique Thursday. Join us in creating and sending works of art wrapped around words of encouragement in our card making classes! If you follow my blog you know I love butterflies. Having released them at our wedding, they've become our family's logo. So taking this twist on water-coloring and adding sparkle in a unique way has me smiling extra big. I love using this technique (Happy Technique Thursday) to create dazzling images! Grab your Aqua Pen, the lid off of an Embellishment box, your Dazzling Details and the Calypso Coral Ink-Refill/ReInker and join this fun ride in a cool hand-stamped card! A thank-you card SHOULD Sparkle! Punch a banner end to this 1" piece of Very Vanilla card stock. Using the B.Y.O.P. 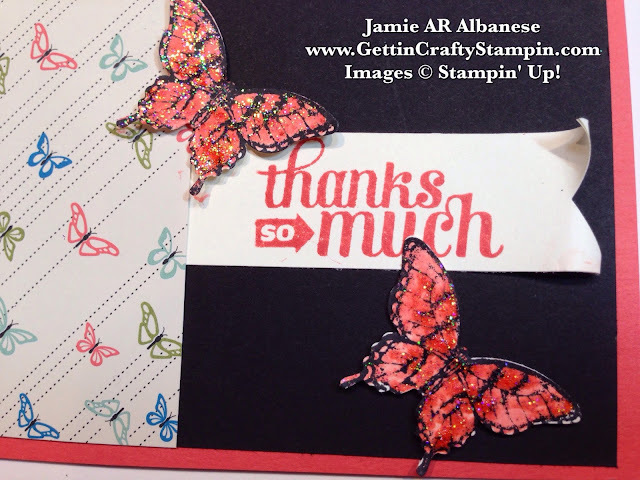 photopolymer stamp set on a Stampin' Pierce Mat to stamp this pretty 'thanks so much' greeting. Curl the ends with a Bone Folder for some fun movement to this hand-crafted card. Have fun in your crafting!! I love adding a little dash of sparkle and jazz to my hand-crafted cards and projects. This twist of 'water-coloring' using the Aqua Pen with the Dazzling Details and Calypso Coral ReInkers/Ink Refills makes for a dynamic way to color in this pretty butterfly. With pretty Designer Series Paper like this Pretty Petals stack you can wow with a simple word and coordinated crafting supplies. Join Us and create pretty cards at the upcoming Stamper's 10 Club (this Saturday) and the amazing Vintage Leaves and Crafternoon THIS MONTH!! Hurry and RSVP to create some beautiful works of art.